The Gmail account to be the default account for sending emails. Fortunately Thunderbird separates sending and receiving accounts. What you want is just the Hotmail account set up in Thunderbird, but set up the GMail account to be the sending account. 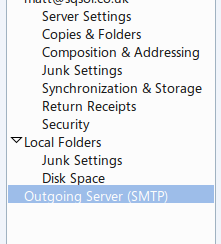 Make sure the only account listed is the Hotmail one, and then select the Outgoing Servers section. In there you will probably have both the Hotmail and GMail listed. Just remove the Hotmail account from there. Now all email will be sent from GMail, and you will only be able to receive the email in Hotmail. In Thunderbird, how to prevent users from creating new mail accounts?